The ELASTOLINE F, the latest type of the series, was launched only in 2010 at the Hennecke ELASTOLINE Days. After the ELASTOLINE V has been a success in the market for Vulkollan® applications for decades, the ELASTOLINE F can already boast a similar track record because many contracts have been awarded and the market shares are on the rise. In particular, there is a growing demand in the area of TDI and MDI prepolymer processing. Reason enough that this field of application will be the key factor in the continuous further development of the series. If you ask Hennecke customers about the specific quality features of the ELASTOLINE F, you will get very different answers because of the machine’s wide range of applications. Two properties, however, areappreciated by all safisfied processors throughout the world: excellent versatility and performance under very tough operating conditions. This systems advantage is demonstrated by the areas of application in which the solid machine system is preferably used, including the production of wear and spare parts for the global oil and mining industries. For example, such parts are used as wear protection for inside pipe linings, in elementary components of cleaning pigs for oil and gas pipelines or in the production of separators for the mining industry. New process features for an increased range of applications There is no doubt about it – the ELASTOLINE F has established itself in the market. But for Hennecke this is no reason to sit back and rest. In the model year 2012, new process features are successively added to enhance the specific possibilities of the state-of-the-art processing system. For the strong worldwide demand for TDI prepolymer processing, MBOCA (4.4‘-Methylene bis [2-Chlororaniline]) is still the number one crosslinker because of its excellent product and processing properties and its optimal price-performance ratio. 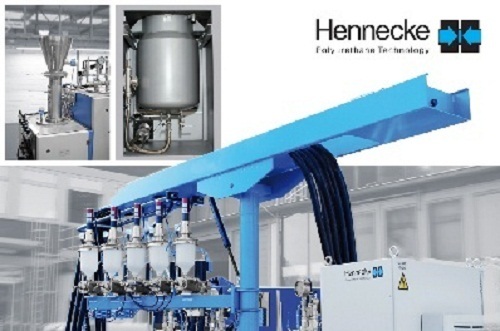 For processing MBOCA, Hennecke has developed an automatic melter that has been integrated into the ELASTOLINE F.
This ensures a uniform melting performance combined with easy and largely automated handling. One major advantage is the careful treatment of MBOCA during the melting process, thus preventing excessive heating and quality losses of the crosslinker. This special type of melter has also been successfully launched for other high-melting crosslinkers such as HQE (Hydroquinone Bis [beta-hydroxyethyl] Ether). When it comes to processing high-melting crosslinkers, the ELASTOLINE F has proved extremely reliable. For example, cold bridges are avoided throughout the whole metering flow so that the necessary processing times from 110° to 130° Celsius can be kept at a constant level without any problems. Big worktanks for larger products The ELASTOLINE F can be equipped with a new type of 500 litre work tank. This provides the processor with sufficient homogenized material for producing especially large parts with high shotweights in a continuous casting process. For example, products such as maritime buoys or marine fenders with weights of over 200 kilograms can be manufactured on the machine in one casting operation. Compared to manual production, the customer also benefits from consistently homogeneous product qualities. The focus was not only on large, but also on very small processing quantities so that additives such as stabilizers or catalysts can also be processed directly. In cooperation with the customer, Hennecke has achieved the target of processing material quantities from as little as three grams per minute directly in the mixhead. For this purpose, the specific injector technology of the MEL series mixhead has been modified to ensure that small amounts can be safely controlled. Great importance was also attached to easy cleaning and reliable metering where clogged valves or the like are not an issue. The major customer benefit of the system is that common additives (Stabaxol; Dabko etc.) can be metered directly into the mixhead. This saves the customer the cost and time of premixing with a neutral substance. Matthias Klahr, Head of Sales of Elastomer Metering Machines at Hennecke, is very satisfied with the current state of the worldwide market launch of the ELASTOLINE F. The new developments described above demonstrate that Hennecke counts among the world’s innovation leaders in the area of Elastomer processing. Hennecke customers especially appreciate the versatility, quality and effectiveness of the ELASTOLINE metering machine portfolio. Machines like the ELASTOLINE V and F are important components for processing more and more complex PU elastomer systems all over the world. It can therefore be assumed that the success story will continue.